Following its successful demonstration during the 44th Union World Conference on Lung Health, the TBDx technology was directly shipped to Abuja, Nigeria in preparation for a second important evaluation. This evaluation, funded by a grant provided by the European and Developing Countries Clinical Trial Partnership (EDCTP), brings together multiple collaborative partners: the Liverpool School of Tropical Medicine (LSTM), the National TB and Leprosy Control Program (NTBLCP), the Federal Capital Territory – TB and Leprosy Control Program (FCT-NTBLCP), and the Zankli Medical Center (ZMC) Research Laboratory. Though the study will be performed with technical support from APVS, it will be independent from APVS to ensure unbiased, objective analysis. According to the World Health Organization (WHO), with a population of 170 million, Nigeria is ranked 4th among the 22 most TB-burdened countries. More than 90,000 new TB cases were reported in 2012, of which 59% were detected by smear microscopy and 37% by culture. The TBDx technology represents an opportunity to detect additional TB positive cases, automating a process that requires less training and laboratory support, and provides faster notification that can reduce transmission rates within the population. The performance of TBDx will be evaluated using cases from adults with symptoms of pulmonary tuberculosis, with and without HIV co-infection. It is projected that 50% of all TB positive cases may have HIV co-infection. Patients will be recruited from district hospitals within Abuja. The TBDx performance will be compared with routine laboratory fluorescent microscopy, using MGIT culture as the laboratory reference standard. Similarly to the evaluation in South Africa, the TBDx performance will be evaluated as a likely screening technology for GeneXpert and other NAAT / PCR technologies participating in the study. As noted in the protocol: Streamlining M. tuberculosis testing with diagnostic platforms that allow the screening of large number of specimens without compromising quality and facilitating the selection of specimens for further testing would be a significant step forward for busy laboratories. There is an important distinction between the South African and Nigeria evaluations. In South Africa, the APVS staff operated the TBDx technology, receiving and processing slides read by laboratory microscopists. 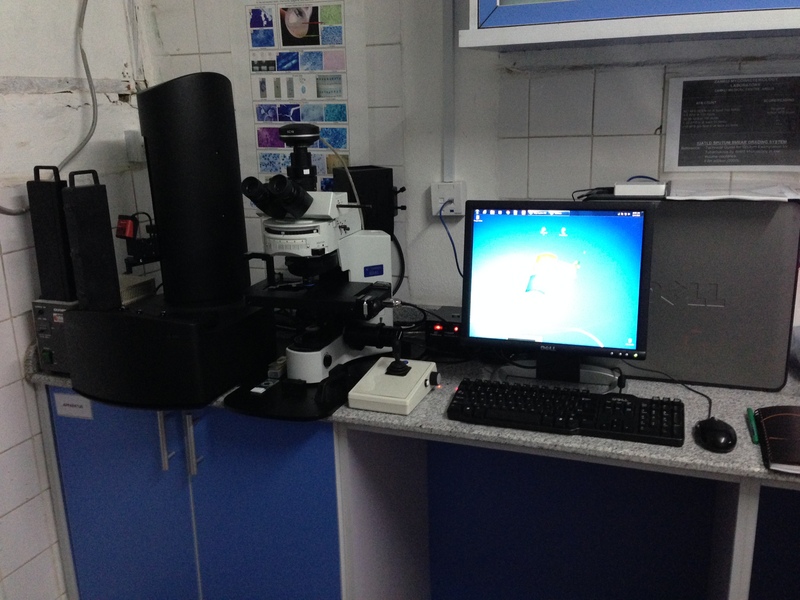 In Nigeria, the Zankli Medical Center staff will be operating the technology over multiple months, providing a thorough analysis of the operational characteristics of the TBDx technology and how it fits into the daily workflow of the laboratory staff. Our Director of Engineering, Tosh Sondh, has been in Abuja this past week engaged in an intensive education and training program that has been developed for the laboratory technicians who will be operating the technology. Designated ZMC staff has been attending Good Clinical Laboratory Practices (GCLP) and Good Clinical Practice (GCP) training throughout the past 3 days and the weekend. TBDx™ user manuals have been prepared and reviewed. The LSTM has prepared a Standard Operating Procedures Guideline that is GCLP compliant. Five laboratory technicians operating the technology have been thoroughly trained in operations, troubleshooting, data gathering, and reporting. The technology is up and running. Updates will be provided to our readers in the weeks and months ahead. This entry was posted in Healthcare, TB and tagged Automated Detection Of Tuberculosis, computer vision diagnostics, digital image processing, Nigeria, signature mapping, Sputum Smeared Slides, tb diagnostics, tbdx, World Health Organization, Zankli Medical Centre. Bookmark the permalink. Great job gentlemen . .
I’m sure that the evaluation will provide enthusiasm and promise for the close at hand future. Congratulations to all involved !